Swiggy is a food ordering and delivering app in India. It is currently available in Agra, Ahmedabad, Allahabad, Amritsar, Aurangabad, Bangalore, Bhopal, Bhubaneswar, Chandigarh, Chennai, Coimbatore, Dehradun, Delhi, Faridabad, Goa, Gurgaon, Guwahati, Hyderabad, Indore, Jaipur, Jalandhar, Kanpur, Kochi, Kolkata, Kota, Kozhikode, Lucknow, Ludhiana, Madurai, Mangaluru, Manipal, Mumbai, Mysore, Nagpur, Nashik, Noida, Pondicherry, Pune, Ranchi, Surat, Thiruvananthapuram, Thrissur, Tirupati, Tirupur, Trichy, Udaipur, Vadodara, Varanasi, Vellore, Vijayawada, Vizag & Warangal. 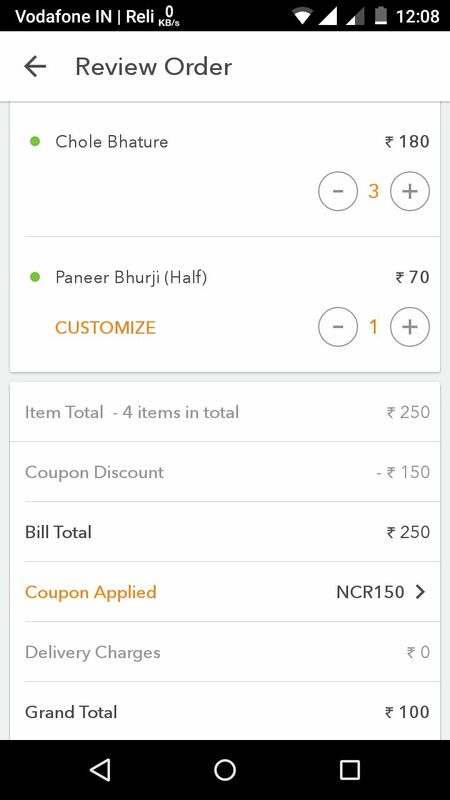 For new users, Swiggy has a coupon / referral code which offers Rs. 100 off on first order above Rs. 199. Just sign up on app and enter the code P91CP7 to get Rs. 100 off on first order above Rs. 199. This offer is valid on VISA/MasterCard Credit or Debit Cards, Net Banking, PayTM, FreeCharge, and Mobikwik wallets. I have ordered many times from Swiggy and really liked the delivery experience. They deliver food from your neighborhood local joints, your favorite cafes, luxurious & elite restaurants in your area, and also from chains like Dominos, KFC, Burger King, Pizza Hut, FreshMenu, Mc Donald’s, Subway, Faasos, Cafe Coffee Day, Taco Bell, and more. This is how Swiggy work. You place a order on Swiggy at your favorite restaurant. Delivery agents from Swiggy pick up the order from restaurant and deliver it to your home. On Swiggy, you’ll be able to Also Readlive track your delivery right from the restaurant to your doorstep.